Product #60621 | SKU 6-303 | 0.0 (no ratings yet) Thanks for your rating! 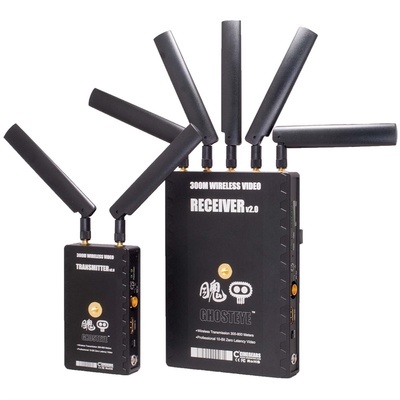 The Cinegears Ghost-Eye Wireless HDMI & SDI Video Transmission Kit 300M V2 (V-Mount) includes a single transmitter and single receiver, but supports up to four receivers simultaneously. Moreover, its cross-compatible with all other Ghost-Eye versions (100M, 150M, etc. ), so you can connect longer/shorter-distance receivers if you'd like. Whether in a point-to-point or point-to-multipoint configuration, your HDMI or SDI signal is carried with a low latency rate of less than 1 ms over the licence-free 5 GHz frequency band. A minimum distance of 985' (350m) line-of-sight is ensured, while the maximum distance is 2295' (700m) line-of-sight. (The kit has even been successfully tested at much longer distances in open spaces). The set is also capable of HDMI/SDI cross conversion, so you can input a signal via HDMI and output through SDI, or vice versa. Small obstacles in the line-of-sight are compensated for by an adaptive signal logarithm, keeping your signal connected. For safety, signals dropped due to interference or loss of line-of-sight are automatically relinked within 1 ms of the obstacle being removed—auto-relink and improved hardware for a more stable connection are the new features in the V2 version. Other features of the set include AES-128/256 signal encryption and plug-and-play installation. The receiver features a V-mount battery plate attached on the back while the transmitter offers a Sony L-series type plate. Batteries are sold separately.